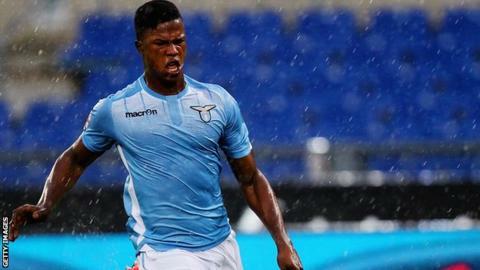 Lazio's Keita Balde Diao has told BBC Sport playing for Senegal will make him "a great player", as he committed to the Teranga Lions over Spain. The 20-year-old was born in Spain, but is eligible to play for Senegal where his parents are from. His Italian club did not release him to play at the upcoming Olympic qualifying event but he wants to play in Rio if Senegal can qualify. "I'll definitely follow the results and hopefully we can qualify," he said. "I was born in Spain and I grew up there but I've already made a commitment to play for Senegal and that won't change." "I wish the team well in the championship. I will keep working hard at my club because only a good performance will give me a chance to play in Rio. "I don't know what to expect but I will be delighted to play because the world will be watching." The eight-nation Under-23 Africa Cup of Nations, which acts as a qualifier for the 2016 Olympics, begins on 28 November. As the tournament falls outside Fifa's international match calendar clubs are not obliged to release players. Keita, who is yet to play for his country of birth at any level, admits he was thrilled to have been approached by the Senegalese Football Federation (FSF). "Senegalese officials spoke to me three weeks ago about playing at the U-23 championship and I feel very privileged and honoured," he told BBC Sport. "I did not rush my decision. I spoke to those close to me and realised that I have a big chance of becoming a great player by playing for Senegal." He added he understood his club's refusal to allow him to play at he Under-23 Nations Cup in Senegal. "It's only a little disappointment but I deeply understand the club's point of view," he explained. "I was born in Spain and I grew up there but I've already made a commitment to play for Senegal and that won't change. "It will be a great honour for my family and my career to wear the Senegal colours." Keita came through the prestigious youth ranks at Barcelona from the age of 10 until 16, when he signed for Lazio in the summer of 2011. He made his senior debut for Lazio in September 2013 and has since gone on to make 79 appearances for the Rome-based club scoring 12 goals.